This is a second oil sketch that I did on location on Bannerman Island in the Hudson River yesterday. It was a real challenge with time consraints on such a complex subject. This is the remains of the castle residence at the peak of the island. I tried to walk around the island as much as possible during the time I was there, both to take photos to work from and to do some paintings/sketches on location. I’m pleased with this one in many ways, and look forward to doing some more from this area of the island with this color reference and my photos. I may or may not go back into this painting and bring it to a more finished state. Bannerman’s Island and the castle-like structures there are amazing sites in the middle of the Hudson River. 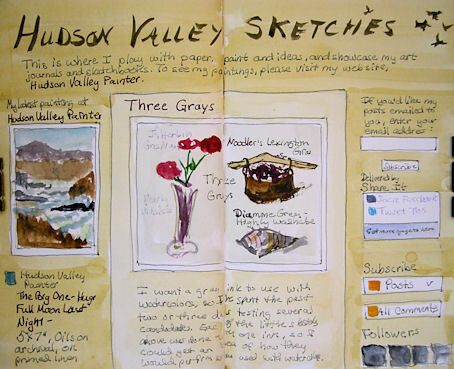 They are a plein air painter’s dream. The island is currently owned by New York State, and access is prohibited except by special arrangement. A huge series of explosions on the island nearly leveled the buildings. The remains are barely standing and very dangerous—hence the need to limit access to the public. 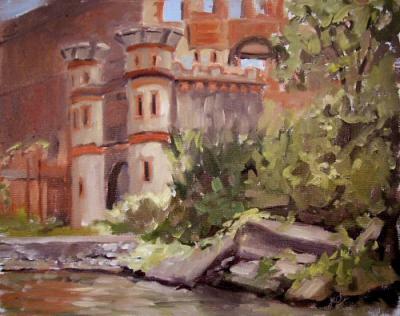 Today, Bannerman Castle Trust took me to the island for a day of plein air painting. 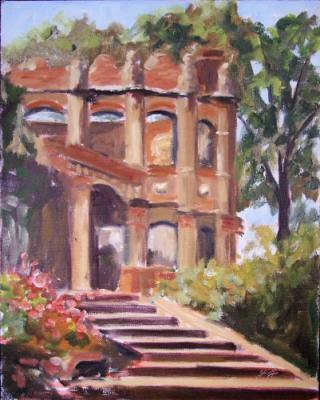 I have a show at the Bannerman Island Gallery in October and will be selling some paintings of scenes on the island. I’ll be keeping this one for awhile as a color reference so that I can do many more paintings from the photos I’ve taken and this plein air piece. Those will be for sale and I’ll post them as I do them. If you’d like a painting of this scene, please email me and let me know what size you’d like, and what medium you want it painted in. Tomorrow and Sunday I’ll be posting other paintings that I did out on the island today, so stay tuned! This is a work in progress, painted today at the Orange County Arboretum. The painting fell into my palette as I was nearing the finish line. I spent nearly an hour scraping off piles of pure red, yellow, blue and white from the canvas and repainting damaged sections. 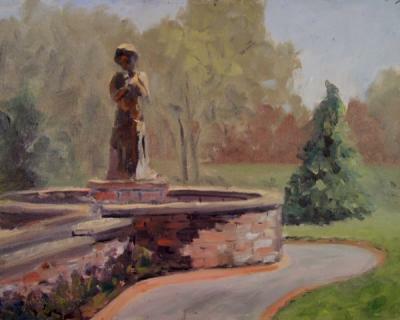 The background muddied in the process and lightened from the accumulation of a substantial amount of titanium white that landed there in a big glob. It was not a pretty sight! I’ll have to wait until it tacks up a bit and will do some value adjusting and retouching. Then I’ll repost it and add the Paypal link. Until then, you get to see my “WIP” (work in progress). 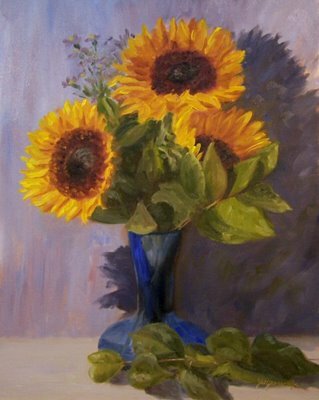 I planted sunflowers in my fenced garden this year because they are such fabulous painting subjects, but the deer always ate them when I didn’t have them fenced. I didn’t stake them, however, and they got knocked over in a storm. I did the next best thing and bought a bouquet of them over the weekend. I finally got around to arranging them in a cobalt vase and painting them. This painting is awaiting a few more tweaks, so is not yet available. I’ll repost when I consider it finished!